The transmission system in your vehicle allows changing of gears, and they generally consist of the following: lower gears are power gears, which help your vehicle get moving and climbing uphill. ?Higher gears, on the other hand, are used when your vehicle needs more speed while facing less resistance. Transmission systems also come in two kinds: if you have a standard or manual transmission, then you have to do the work of shifting gears yourself. But with an automatic transmission, the vehicle shifts gears on its own. It automatically starts out in low gear and automatically shifts to high gears as it gets rolling. Again, it will automatically shift to a lower gear to climb hills or when you need a burst of speed. How does it know when to change gears? Today’s automatic transmissions are computer-controlled. The computer gathers information about what the vehicle is doing and changes the gears as needed. Automatic transmissions are becoming more sophisticated all the time. And they add more gears or ?speeds.? ?Almost all vehicles have at least four speeds. Five or six is common. Some are even increasing to seven or eight ? up to ten. Adding gears has a lot of advantages for vehicle owners: it improves fuel economy and increases performance. 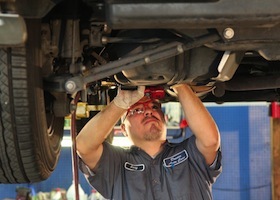 But there is a drawback for drivers looking for transmission service in Cathedral City. More gears equal more parts and a more complex transmission system. Plus, all those parts need to fit into the same space as older, less complex transmissions. This means that today’s transmissions are engineered to much tighter tolerances. In other words, they demand meticulous care from drivers. Transmissions are durable. But that durability requires proper care from a transmission service in Cathedral City. That’s why changing transmission fluid is such an important part of preventive maintenance. Transmission fluid lubricates the transmission and keeps it in good working order. But if the fluid runs low, transmission parts will wear out quickly or suffer damage due to increased friction. The transmission can even fail. New transmissions aren’t cheap. Repairing them isn’t cheap either. 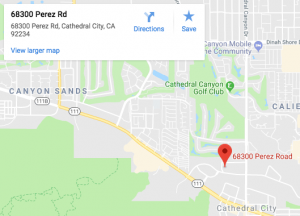 But changing transmission fluid is fairly inexpensive at Davies Auto Care, which provides the quality of auto repair cathedral city residents expect. That’s why responsible car care includes transmission repair cathedral city cars need. It doesn’t take a genius to figure out that periodic fluid changes aren’t just good auto advice, they actually pay for themselves by reducing the need for transmission repairs. If you need some maintenance and repair for your vehicle’s transmission, contact Davies Auto Care and we’ll assist you with all of your concerns.